Cameras for a rasstoyka it is intended for a rasstoyka of test preparations of the widest range bakery and confectionery at trade enterprises, the baking industry, bakeries, bread-baking complexes, bakeries, confectionery shops. Rasstoyka - important technological process within which yeast actively processes sugar available to them forming carbon dioxide which gathers in bubbles and at the expense of it lifts dough. 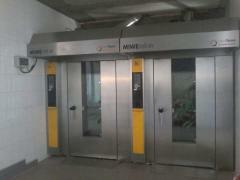 The corresponding stable temperature and humidity is necessary for effective course of this process. 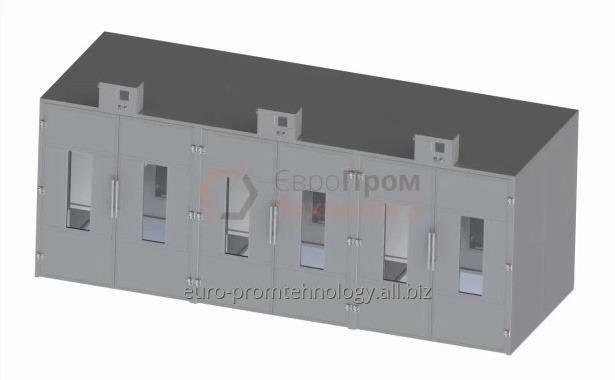 Modern cameras of a rasstoyka allow to maintain necessary temperature in the set framework due to use of automatic equipment, existence of transparent doors allows to control a condition of bread and pastries visually. The camera of a rasstoyka is created by our firm - one of the best in Ukraine in this branch. Thanks to the modern decisions applied to circulation of warm air and humidity, temperature is a constant. The unit does not create fluctuations of temperature in the camera, especially in big cameras of a rasstoyka. Usually units, are placed in a camera corner, create one continuous stream of air that causes uneven growth of the test and demands rotation of the cart with the test in the course of a rasstoyka. Our products create the closed, uniform circulation of hot air. Characteristic: The camera (on two and more carts racks) may contain one and more channels which provide distribution of moisture and hot air to the shortest time. It can influence the correct and uniform growth of the test in the camera. The camera of a rasstoyka is executed from bagatosharovy panels and a dverim, executed from high-quality stainless steel and contain partially glass (or a double-glazed window) for the review of preparations. Doors of the cell of a rasstoyka are condensed with a rubber profile for the best sealing of doors for the purpose of reduction of heatlosses in an opening zone. All materials of which the camera is manufactured are resolved in the baking industry. The set temperature and humidity is supported automatically. The control system of the camera of a rasstoyka allows to maintain automatically the stable necessary temperature and humidity. The high-precision device of tracking of import production is used to maintenance of necessary level of humidity. 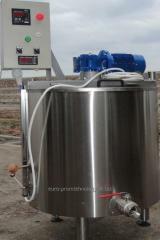 The system of a parouvlazhneniye consisting of fans, the directing air streams on the heating and moistening elements provides in the most optimum way uniformity of humidity and temperature in any point of the camera. For convenience of service personnel the camera is equipped with lighting. * — parameters can differ from specified according to the order of the client. Unbelievable price on Compartments for proofing the unit (steam generator) in Kamenka-bugskaja (Ukraine) company Evro Prom Tehnologii, ChP.